Steak houses specialize in big red wines—almost exclusively California Cabernet. Lettie Teague takes their measure on a three-city trencherman's tour. As wine lists become more and more esoteric, featuring unpronounceable grape names and growing regions not found on any Rand McNally map, bewildered wine lovers may wonder if there's someplace left where they can still find familiar places and names. There is, and it's called an American steak house. Although I probably eat in steak houses only every six months or so, I've been fascinated by their wine lists for years. Just as steak house menus seem to have their own paradigm (porterhouse, creamed spinach, onion rings) so too do steak house wine lists seem to exist in a world of their own, where entire countries like Spain and Germany are barely acknowledged, price isn't a consideration and California Cabernet reigns supreme. Why California Cabernet? It makes perfect sense. Cabernet, after all, with its tannins and structure, is an ideal counterpoint to rich and fatty meats. And the sweet fruit of most California examples appeals to an American (read: steak house) palate. Certainly California Cabernet is prestigious, as a look at the prices of the most sought-after bottles will reveal. Indeed, over the past few years, California Cab has achieved a near-monopoly on steak house lists, even displacing other esteemed reds like Bordeaux. The exception seems to be the wine lists at the new breed of celebrity-chef steak houses, where Bobby Flay, Charlie Palmer, Laurent Tourondel, Tom Colicchio and other big names are creating their own innovative takes on Smith & Wollensky—with more innovative wine lists to match. But are the wine lists at any of these steak houses—the classic ones as well as the newcomers—any good? Was there anything on them beyond expensive California Cabernet? In search of some answers, I set out on a three-city tour focusing on places famous for their commitment to steak: New York City, Chicago and Dallas. As a rule, most steak houses aren't keen on people bringing their own bottles. In fact, the woman at the Chicago Chop House seemed offended by the idea. "We have a very nice wine list," she said. Gibsons, on the other hand, does allow diners to bring their own wine for a corkage fee ($20 a bottle). But when I called Scott with the good news about Gibsons he hardly seemed cheered. "But they don't know me there," he replied. But the wait allowed me time to check out the Gibsons wine list, which was almost entirely American with a large number of California Cabernets. Prices were a bit better than at most steak houses (with plenty of choices under $100) but there wasn't much for the adventurous-minded. The most exotic offering was the 2002 Don Melchor Cabernet Sauvignon ($79), one of Chile's flagship wines. Once we were finally seated, the pace picked up considerably. Steak house waiters, it seems, all operate on the same setting: superfast. In fact, our waiter arrived at our table almost before we did. "What can I get for you?" he inquired breathlessly. Could we speak with the sommelier? we asked. Our waiter shook his head and announced with a smile, "I am your drinks guide. I am your sommelier. I am here to cater to you." This odd combination of toadying and bravado was something I came to recognize as steak house style. Was there a wine our waiter/drinks guide could recommend? He leaned over. "I'm a big fan of the Gibsons Merlot," he said, adding confidentially, "We develop the grapes ourselves." In fact, he was happy to give us a taste. "Look at these wineglasses," said Scott disapprovingly, holding one by the stem when our waiter had moved out of range. "Let's ask him if he can cater to our preference for some better glassware instead." After a taste of the (thin and rather harsh) Gibsons Merlot, Scott and I agreed upon a bottle of the 2002 Mount Veeder Cabernet. At $59, it was a great buy, especially compared with the price at other steak houses I visited, where the Veeder ranged from $10 to almost $30 higher. Indeed, the Mount Veeder showed up so regularly at steak houses it became a barometer by which I could judge how overpriced the list was. The Mount Veeder was well-made if not particularly exciting. Our waiter, however, was visibly impressed with it. "This is fuller-bodied than the Gibsons Merlot," he marveled when we gave him a taste. Scott also wanted to try one of the Bordeaux he'd brought. When we presented our bottle of 1989 Château Palmer to our waiter, he rushed off to get us some better glasses. He returned not only with slightly superior, if technically incorrect, glassware (Burgundy balloons) but also a manager in tow. "We don't see much French wine around here," the manager noted, eyeing the bottle with what seemed like envy. (There were only two French wines—one white, one red—on his list.) "I guess people haven't really forgiven the French," he added. The anti-French bias appeared to extend well beyond Gibsons; I didn't find much in the way of French wine on most steak house lists. Even Bordeaux, the traditional companion to steak, proved pretty scarce. Outside of an anti-French bias, I wasn't sure why: After all, the main problem with Bordeaux today, its high price, didn't seem to apply in restaurants where a mid-range Napa Valley Cabernet could easily cost $125 a bottle. One exception to this non-Bordeaux rule was the wine list at the Chicago Chop House, which was more diverse than most of its steak house competitors, with Bordeaux spanning two pages instead of two paragraphs. But, alas, it was pretty overpriced: The 1989 Palmer cost $633 a bottle. "I picked up that wine two weeks ago for $160," Scott scoffed. Robin, our waiter/sommelier at the Chicago Chop House, had quite a few wine recommendations—none of them French. California Cabernet was his first suggestion, the ubiquitous 2002 Faust from Napa ($88). "It's so purple it will stain your hands," he declared. (Was this something steak house diners particularly prized?) Otherwise, Robin was keen on Australian Shiraz. "The d'Arenberg Dead Arm Shiraz is amazing," he told us. He also liked Chilean Syrah. "I'm selling a lot of bottles of Montes Alpha tonight," he confided (a bargain at $38 a bottle). I asked him what he thought of the 2003 Domaine du Vieux Télégraphe La Crau Châteauneuf-du-Pape ($78). Robin tried to work up some enthusiasm for my selection but the most he could say was that my timing was good: "The price of this wine is going up a lot soon." Clearly he was disappointed I hadn't chosen any of his preferred wines but why did he take it so personally? "I think steak house waiters are just used to knowing more than their clientele," Scott speculated. It was an interesting theory. Certainly my waiter at Smith & Wollensky in Manhattan appeared to feel himself fully in charge when he waved off my request to speak to the sommelier. "What do you want to spend?" he asked me. Somewhere around $60 or $70, I replied. While this may sound like a reasonable amount in most restaurants, it's a relatively small sum in a place like Smith & Wollensky, where verticals of Kathryn Kennedy priced at nearly $300 a bottle are more the norm. There are some random well-priced wines among the Cabernets and Zinfandels, but these appear almost as an afterthought on the power-focused all-American list. They were, however, the wines I was focused upon. I wondered what our waiter thought of the 2001 Burgess Vintage Selection Cabernet? (Burgess is a good, underrated Napa producer and the wine was well-priced at $57 a bottle.) Our waiter appeared cool to the idea so I offered him an alternative. What about the 2002 Green & Red Vineyard Chiles Mill Vineyard Napa Valley Zinfandel ($55) from an excellent if little-known Napa winery specializing in Zinfandel? Our waiter didn't hesitate. "Go with the Cabernet," he said decisively. "Cabernet is always better." At Outback Steakhouse in suburban White Plains, New York, my waiter Ryan (also the de facto sommelier) was equally definitive in his selection. "Go with the Wente Syrah," he said confidently. Granted, there were only 10 other reds (and nine whites, all supermarket-level selections) on the sorry Outback wine list—the first steak house list I've ever encountered that groups wines according to fruitiness. To Ryan's credit he didn't name the most expensive wine (Franciscan Cabernet, $37). "I really like the Wente," Ryan urged. And while the Wente ($19) turned out to be rather aggressive and coarse, it did have some flavor—more than could be said for my 16-ounce Prime New York strip. Perhaps Ryan knew this and suggested the pairing accordingly? Of course not all the steak houses I visited had waiters who doubled as sommeliers; some actually had wine directors and those places, by and large, had better wine service (and glassware) though not necessarily cheaper prices or, for that matter, less California Cabernet. Tosha Norris, the wine director and sommelier at Old Homestead in Manhattan, which claims to be New York City's oldest steak house, was as absolute in her recommendation of the 2003 Ridge Lytton Springs Zinfandel as Ryan at Outback had been about his choice of Wente Syrah. "A lot of people think Cabernet is the only wine that goes with steak, but they don't think about the sauce," she opined. "The Zinfandel works great with the sauce because it has some fruit sweetness." Yet the relatively run-of-the-mill list featured about 70 fairly commonplace California Cabernets and only three Zinfandels, which meant that either no one was eating sauce with their steak (although just about every table held a bottle) or Norris needed to off-load some Zinfandel and saw me and my friend as an easy mark. She turned out to be right: The Zin complemented the sweet steak sauce nicely. And besides, Ridge always makes reliably good wine. Ten or so blocks away from Old Homestead, at the snazzy newish Laurent Tourondel steak house BLT Prime (where "Disco Inferno" was the background music of choice), the young and extremely fast-moving sommelier Colin Campbell pronounced himself a proponent of Pinot Noir and steak. And his list actually reflected this preference, with a substantial selection of Burgundies and American Pinot Noirs, not to mention nonsteak house standards like Grüner Veltliner and Albariño, which made it the most refreshingly international list of all. "About half my wine sales are Pinot Noir," confided Campbell. The other half? Cabernet, of course. In fact, the night I was there, he sold three bottles of California Cab in quick succession, each one more expensive than the next (a 1997 Harlan Estate Maiden, 1997 Caymus Vineyards Special Selection and 2001 Bryant Family Vineyard, at $390, $458 and $597, respectively). But for me, he suggested the reasonably priced 2004 ElvenGlade Oregon Pinot Noir ($66), assuring my friend Wayne and me that it would stand up to the porterhouse we shared. 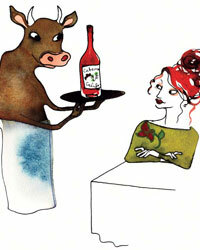 "Oregon Pinots are so rich and concentrated, especially in the 2004 vintage, they can take a steak," Campbell opined. I was a bit skeptical of the match, especially since Laurent Tourondel's food is famously rich, but Campbell turned out to be right: The wine seemed to grow in the glass, taking on substance and structure. It worked perfectly, I said to him. "I thought that it would," he declared with pride. While the BLT Prime list was the one I admired the most in all my travels, I found no sommelier more engaging than Randolph Hollo at Del Frisco's Double Eagle Steak House in Dallas, where the steaks were some of the best of my tour. Hollo radiated the excitement of a man whose greatest happiness was to spend his life amid hundreds of Cabernets. Hollo's California Cab selection ran for eight pages and according to him they accounted for "about 95 percent" of his sales. When I asked for a recommendation, he named at least eight California Cabs without seeming to draw a breath. "There's the '03 from Turnbull. Always a reliable producer. Or the Stuhlmuller. That's a good wine. Or the 2000 Ferrari-Carano, that's the best pick of them all right now. Or the Jayson second label of Pahlmeyer. That's drinking beautifully now. Frank Altamura is making terrific wines, by the way. I like his 2001 Altamura Cab, but the 2002 is really dynamite. And I also like the Faust—that's really good. It's the second label wine of Quintessa." (At $125 a bottle, the Faust was a full $37 more than it was at the Chicago Chop House.) Then suddenly, Hollo paused and pressed his fingertips together. "But there's a wine that I really love and I just got in. I can give you a good price on it too: the 2002 Hartwell Vineyards Misté Hill Cabernet. It's a delicious wine, all sweet blackberry fruit. I think you'll love it." When Hollo reappeared with the Hartwell, he was also holding a fistful of Spiegelau glasses. "You need some good glassware to go with that wine," he declared. The wine was pretty rather than powerful, with very ripe, almost sweet blackberry fruit, exactly as Hollo had described it. The style was gentle, almost feminine—nice enough, though not necessarily worth its $100 price. I liked Hollo a lot, but his list, though impressive, was too rich for my blood. There weren't many Cabernets at Del Frisco's priced under $100, aside from some mass-market-level selections like the Francis Coppola Diamond Series Claret. The emphasis was clearly on bottles costing three and even four figures, such as the 1993 Screaming Eagle, a bottle of which Hollo said he'd sold a few weeks before. A certain prominent Dallas doctor had ordered it, thinking the price was $310. Alas, he was off by one zero. "But everyone knows how much these wines cost," I protested. "Don't people care if they're being overcharged? Take the Mount Veeder Cabernet. Do you realize that it costs $20 more here than it does in Chicago?" My sister didn't look particularly concerned. "Isn't this a really good steak?" she replied. My parents, visiting from North Carolina, agreed; my father held up one of the platter-size onion rings admiringly: "Will you look at the size of these things?" Then I realized why steak houses are all the rage and why every chef in the country wants one. There's something about steak that makes people lose their sense of proportion. (Where else would 16 ounces be considered a single serving of anything?) But ultimately I think the reason why steak houses and their wine lists are so successful is that they make people feel comfortable and safe in a world where food comes foamed and sommeliers push unfamiliar names like Nero d'Avola. Steak house customers only have to declare a preference for medium or rare beef, and as far as wine goes, they know they'll find some names they know and can pronounce. Their biggest worry is that they might spend a few dollars more than they need to—and perhaps spill some steak sauce on their blue shirts.